I’ve also advised people to negotiate terms that are essential–even if they don’t sign a fully-negotiated contract–and have both parties sign a document setting out those terms, because you can’t win the battle of the forms. So if–as a seller–a 12-month limited warranty and liability cap in the amount of your product’s purchase price are important to you, you should make sure that you and your buyers sign contracts agreeing to those terms. Otherwise, you’ll probably end up with a broad, four-year warranty and unlimited liability (the defaults under Article 2 of the Uniform Commercial Code, which governs contracts for the sale of goods). These thoughts came to mind when I read a case recently where a buyer signed the seller’s quotation, thus ostensibly negating a term in a contract the parties had signed previously. In that case the parties had negotiated and signed a “non-disclosure agreement, financing and supply agreement.” It’s unclear from the court’s opinion whether the document dealt only with confidential information or whether it also contained a framework for the later transaction. What is clear is that the parties anticipated a later document to control the terms and conditions of the transaction. That document came in the form of two quotations that the sellers presented to the buyers for signature. The quotations detailed the scope of work, schedule of payments, and terms and conditions of sale. From the opinion, these terms and conditions appear to have been standard, non-negotiated terms. 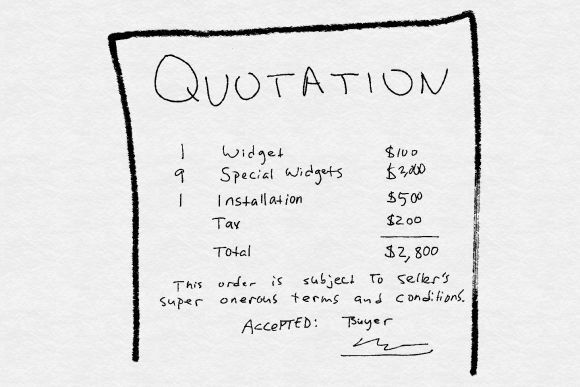 The buyers signed the quotations. When the business relationship went south, the sellers sued the buyers’ principals in the Circuit Court of St. Louis County, relying on the quotations’ forum selection clause. A week later, the buyers instituted arbitration proceedings, which were provided for under the non-disclosure agreement. The sellers moved to stay the arbitration on the grounds that no valid and enforceable arbitration agreement existed between the parties, and the buyers moved to compel arbitration. At issue was whether the forum selection clause in the quotations superseded the arbitration clause contained in the earlier-signed non-disclosure agreement. The court held that the forum selection clause in the later-signed quotation was inconsistent with the arbitration clause in the earlier-signed non-disclosure agreement. Since the quotation was signed later, it superseded the non-disclosure agreement. Thus, there was no enforceable arbitration agreement. Would the case have come out differently if the buyers had not signed the quotations and had put their own terms and conditions into play? It’s certainly possible. Then there would have been a signed arbitration agreement (which was broad enough to cover the issues in dispute) with a later-delivered document from the sellers that purported to impose a forum selection clause. The terms would have been put through the battle of the forms grinder of Article 2 of the UCC, and the sellers’ forum selection clause quite possibly would not have been left standing. What can contract drafters and businesses do to ensure that they don’t end up with unwanted contract terms? Here are a few tips. If possible and feasible, fully negotiate your contracts and have both parties sign them. Draft a set of standard terms and conditions for your company to be used when you are the buyer and another set to be used when you are the seller. The standard terms and conditions should be comprehensive, dealing with all important matters and containing all standard boilerplate clauses. Failure to address an issue greatly increases the chances that the other side’s provision on that matter will control. The terms and conditions should have language that attempts to make you the offeror. There’s a slight advantage in being the offeror in some situations under Article 2 of the UCC, and it makes all the difference under the common law. The terms and conditions should contain an objection to additional and different terms contained in any document presented by the other side, such as a purchase order or quotation. That’s because failure to object to such terms can either cause them to be incorporated into your contract or cause the default rules under Article 2 to govern. In most cases, the terms and conditions should limit the other side’s acceptance of your “offer” to the terms contained in your document. The only situation I’ve been able to conceive of where doing so would hurt you is when your main concern is preventing the other side from reneging on the contract before it’s fully performed. That’s because the conditional acceptance puts contract formation off until the parties perform. Present your terms and conditions to the other side as early in the process as possible, and the terms should be presented each time you send a document to the other side that relates to the transaction. In many cases, terms and conditions should be placed on-line and incorporated by reference into all of your ordering documents (including emails). This helps ensure that they are presented to the other side early and often. If you sign a written contract, the contract should disclaim the effect of unsigned boilerplate terms the other side might later present to you in the ordering process. Train all of your personnel who deal with customers and suppliers with respect to legal and business issues to be cognizant of contract formation and potential contract modification. Otherwise, you might end up with unintended contracts and modifications, such as this case where an instant message conversation modified a written contract. I signed individually to sell RE, However I did not recall at the time that it was conveyed years ago to our current family LLC. I do not wish to sell.